Thanks to Dr. Renuka Agrawal, City of Hope National Medical Center, Duarte, California (USA), for contributing this case and the discussion. To contribute a Case of the Week, follow the guidelines on our Case of the Week page. bioTheranostics announces the launch of an expanded tumor-type database for its flagship product, CancerTYPE ID�, and the launch of KRAS mutational testing. CancerTYPE ID predicts cancer origin in patients whose primary cancer was initially �unknown or uncertain� using conventional diagnostics. Knowing the site where the cancer originated impacts physicians� therapeutic decisions, and the results of the CancerTYPE ID assay can help physicians select optimal therapies earlier in the diagnostic process. 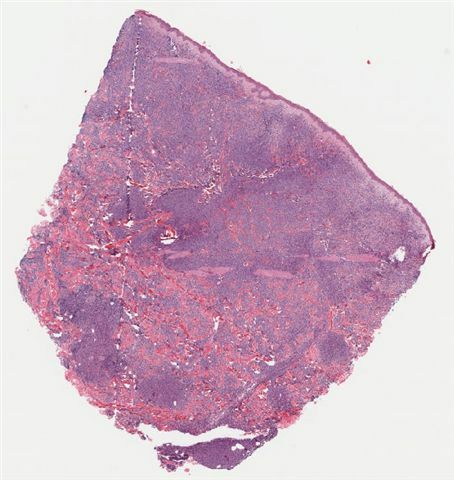 This new database enhances the ability of the CancerTYPE ID assay to discriminate between clinically relevant metastatic tumors occurring within the GI tract, head and neck, lung (squamous, non-squamous adenocarcinoma, and mesothelioma), and intestine, while incorporating coverage of certain tumor types that frequently present diagnostic challenges such as cholangiocarcinoma, ovarian-mucinous adenocarcinoma, and small intestinal carcinoma. bioTheranostics is working on developing additional tests including prostate cancer prognosis and drug-response profiling. For more information please contact Wendy Johnson, Associate Director Marketing, bioTheranostics, 858-587-5887 or click here. (1) We are updating the Bladder and Breast-nonmalignant chapters. (2) Thanks to all who have offered to review chapters, sections of chapters or topics.� We have to review and organize all of the offers, and will respond within 1-2 weeks. A 66 year old man presented with increasing left upper quadrant abdominal pain of two weeks duration. �Physical examination showed splenomegaly and multiple violaceous, indurated, non-erythematous cutaneous nodules on the back and torso, ranging from 3 to 6 cm in diameter. �A CT scan showed splenomegaly and mild abdominal lymphadenopathy, as well as scattered small lymph nodes in the pretracheal region, suspicious for lymphoma. 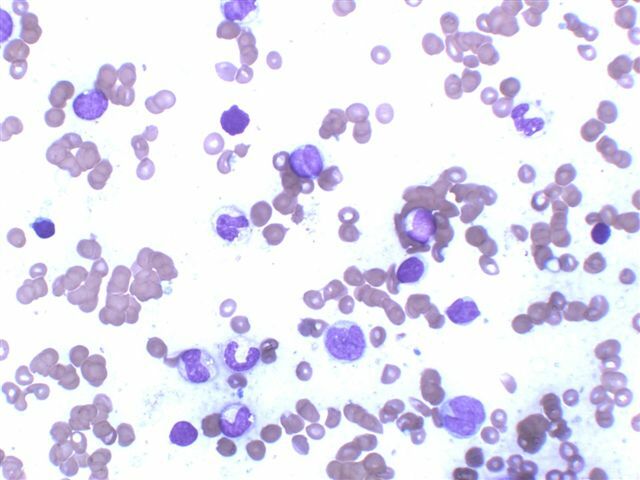 �The patient had pancytopenia with 6% atypical mononuclear cells in the peripheral blood.� Skin and bone marrow biopsies were obtained. 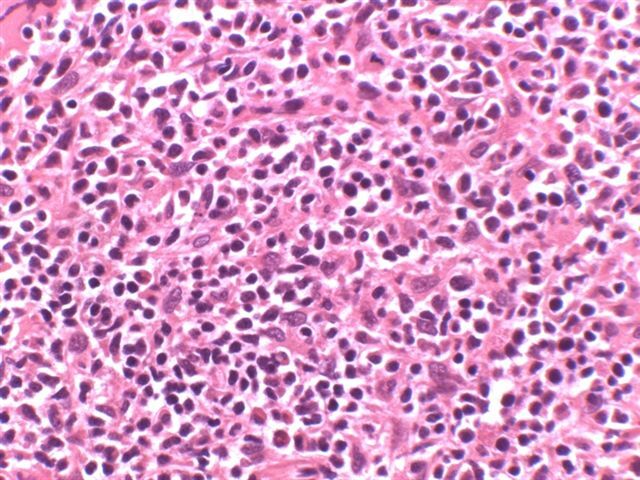 Blastic plasmacytoid dendritic cell neoplasm, called CD4+ CD56+ hematodermic neoplasm prior to 2008, is a rare malignancy, first described in 1994 (Am J Hematol 1994;47:278).� It typically affects middle aged or elderly patients, usually men, who present with widespread skin infiltration (purplish papules, nodules, or bruise-like skin lesions), that have a predilection for the trunk but also involve the extremities and the head and neck. �This is closely followed by lymph node, spleen and bone marrow involvement, often terminating in the leukemic phase with a fatal course. 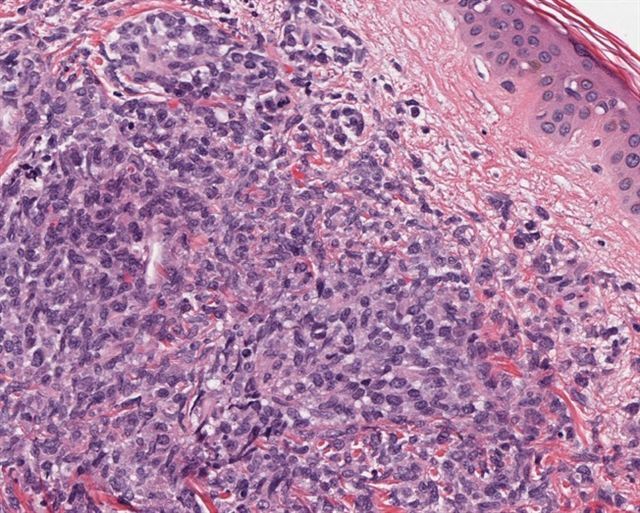 Histologically, these tumors involve the dermis and sometimes the subcutaneous tissue, but show no epidermotropism. �The infiltrates are composed of monotonous, medium sized mononuclear cells, with sparse cytoplasm and finely dispersed chromatin, and absent or indistinct nucleoli resembling lymphoblasts or myeloblasts. Frequent mitotic figures may be seen, but there is generally no necrosis or angioinvasion. As lymphoblastic and myeloblastic neoplasms can also be positive for CD56, stains for CD3 and myeloperoxidase should always be performed to exclude them. Rarely, myelomonocytic cells coexpress CD4, CD56, and CD123, but they also stain for myeloperoxidase, in contrast to HDN. 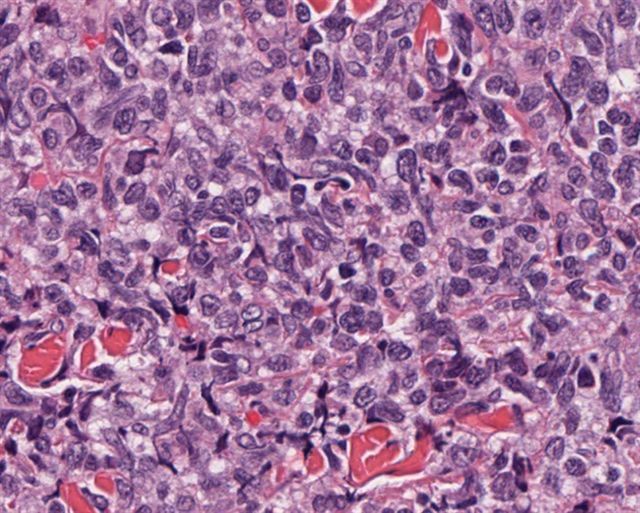 Blastic plasmacytoid dendritic cell neoplasm is characterized by highly aggressive behavior and poor prognosis with a median survival time of 14 months. Patients are best treated with regimes used in acute leukemias. Although chemotherapy usually results in complete remission, there is almost always a quick relapse unresponsive to further chemotherapy (Blood 2002;99:1556).